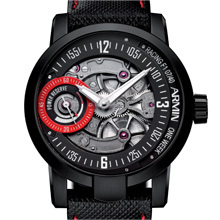 Together with its Formula-1 partner, Marussia Virgin Racing, Armin Strom AG has developed a collection of three exclusive timekeepers, custom-built for motor racing, with titanium or stainless steel cases and the black, red and white dials reflecting the Marussia Virgin Racing team colours. 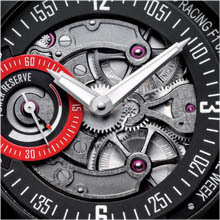 Materials used in motor racing are also used in some of the movement components – a fusion between the motor industry technology and the art of watchmaking. “We could have simply put a logo on our watches. But that would have been too easy for us”, Claude Greisler, Product Development Manager and design engineer with Armin Strom explains the basic idea behind the special series of watches. The starting point was a partnership commitment between Armin Strom and the Russian-British Formula 1-Team Marussia Virgin Racing. “A Formula 1-Engine lasts about 40 hours, then it’s had it. A watch movement when properly serviced will last for ever. We wanted to illustrate and demonstrate this extreme contrast.” The idea emerged quickly, but its realization was to prove very tricky. After a lengthy search, we struck gold with an art foundry in St. Gallen, which in the first place has a prototype vacuum oven and secondly doesn’t throw up its hands in despair, if it has to deliver small quantities. Correct processing is all-important. “Precisely because we have to machine cut the parts afterwards, it was of vital importance, that they have no air bubbles whatsoever. These would have looked terrible on the finished articles afterwards and would also have caused us production problems”, explained the Production Manager. 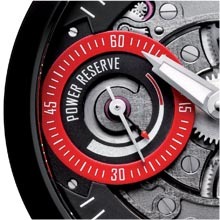 The special liquid aluminium alloy comes out of the oven and is then carefully poured into blocks, which are too thick to be used directly for the relatively thin watch components. Therefore the next stage is a milling process. Then follows the true processing within the Armin Strom Manufacture. The exterior forms of the bridge parts for the Racing One Week and Racing Regulator in the modern “ARMIN” line are constructionally the same. However, their surfaces are totally different. Through the application of various decoration elements, the finished special parts take on a highly technical appearance. The processing of the parts was nevertheless a huge challenge. This material is rarely used in the watch industry. It is very awkward to mill with the usual tools. “We did all sorts of tests”, says Greisler rolling his eyes up to heaven. However it is not in this tenacious hardworker’s DNA to give up, and so he finally found a way to process the material adequately and then to integrate it perfectly into the articles he designed. In pole position, the ARMIN Racing One Week stands unrivalled, with the hand-wound Manufacture movement launched in 2010, with its seven-day power reserve. It is a limited series of 40 pieces.